It’s been one year since I was in Los Angeles shooting my finale for Extreme Weight Loss. One year since I had the accountability and support of the show. I spent one year on the show, and one year transforming my life. My year on the show was incredible. It was filled with incredible experiences, incredible change, incredible growth, and incredible stress. I still cannot even put into words what that year was like. It’s the entire spectrum of emotions all wrapped into a year. It’s the best, the worst, the hardest, the most amazing times all smashed together into what turned out to be an unforgettable time in my life. So, here I am, one year later, one year removed from it all. I still remember the day after we finished shooting, and we headed home from LA. During our year, we received almost daily e-mails from production on what was happening, where to be, weigh in info, travel info, etc. But, as we wrapped up our season, and headed home, I remember thinking “I am never going to get another e-mail telling where to be, or when my next weigh in is”. It was freeing and it was scary. For a year, I had the constant knowledge (and pressure!) of knowing that there was an entire production staff, Chris, Heidi, off camera trainers, other cast members, JD Roth (the show’s creator) and other producers, who all were keeping tabs on me. They all were watching and had input on my workouts, my weekly weigh-ins, and it was a constant pressure to keep up with their expectations. It worked well for me. I thrived on the pressure, most of the time. I spent that year working my tail off and proving that I could succeed. I wanted to prove to myself, to my family, to the show, and to America that I was worthy of the opportunity I was given. I wanted Chris and Heidi to be proud of me, to be glad that they picked me. But most of all, I wanted to be healthy. I wanted the life that I had been dreaming of for so long. And I wanted to look great at my finale. I had so much external motivation to lose weight, to work hard, to push myself. And then it was gone. I realized as I flew out of LA that the remainder of my life was now just mine. I didn’t have anything to prove to anyone. Other than myself. I didn’t have anyone monitoring the scale. Other than me. I didn’t have a trainer provided to me at home. And it was intimidating. I had never succeeded before on my own, and here I was again, on my own. But, the difference this time, was that I knew how to do it. I now knew how to push myself. I knew how to challenge myself. I knew how to eat healthy. I was no longer the obese, scared, overwhelmed girl I had been before. I was now the confident, healthy, new me. Ready to take on the lifelong challenge of staying healthy. It’s been one year since then. Has everything gone as planned? Not always. Have things gone as well as I hoped? Probably so. Do I weight what I did at finale? No. And I’m ok with that. I feel strong. I am healthy. I work hard. I am diligent about my health. I will never again be that woman that let her health take a back burner. I will never again be someone who is afraid to ask for help and make time for herself. One of the things that have helped me is to continue to find ways to challenge myself. During the show, Chris set goals for me. Now it’s my time to set goals for myself. In the year since the show wrapped I have: run a half marathon, competed in my first (and probably only!) 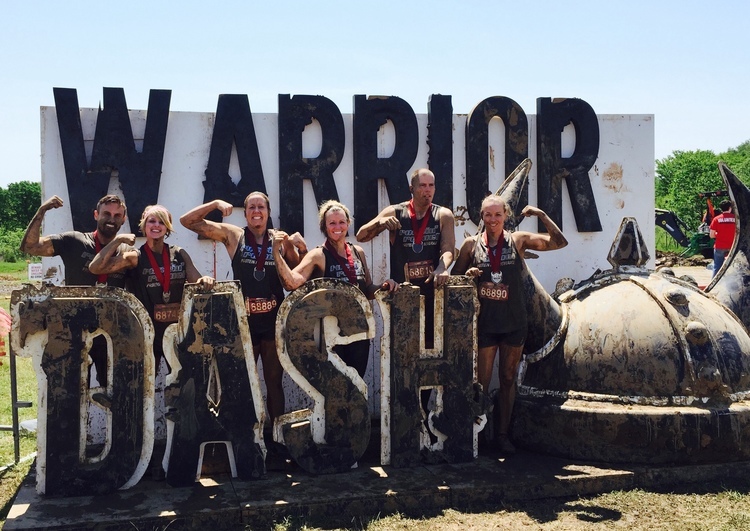 CrossFit competition, run several 5k’s, and tackled the Warrior Dash. I planned and loved every second of my daughter’s wedding. I appeared on the Dr. Oz Show and have had the opportunity to speak to numerous groups and businesses about healthy living. I have so loved blogging and sharing my experiences. Having the accountability and support from people who saw the show or read my blog is priceless. It’s been an amazing year! So, my question for you is, what does the next year look like for you? Will you find ways to challenge yourself? Or will you wait, and wonder what life could be like if you found the courage to change? I love this quote from Earl Nightingale, “Never give up on a dream just because of the time it will take to accomplish it. The time will pass anyway.” Another year will tick by. Summer will come and go, fall and the holiday season will come and go, and before you know it, spring will be here. Another year will have passed by. What will you do this year? What am I going to do? I am going to keep going. You can bet that I will continue to work hard. I am going to continue to share my experiences and strive to continue to inspire others to get healthy. In December, Scott and I will celebrate our 25th wedding anniversary. It’s a big year and another year for me enjoy this new found lease on life. Where do you see yourself in one year from now? Exactly where you are now? Or one year closer to being the you that you want to be? One year of the same old, same old? Or one year of experiences that challenge you and make you better?